Today I spent an hour in the backyard, weeding. We’d gotten some rain, so the soil was moist, making it a prime weeding opportunity. As I bent over, trying to use my garden tool to find the roots of the weeds and pop them out of the ground — because you always want to get the root, of course — I cursed mightily at the humidity, and my aching back, and mostly at the unsightly weeds themselves. And then I wondered — is there any living thing more reviled, more roundly cursed, more uniformly despised by one and all than a Midwestern weed? Consider this awful dandelion that had taken root in our garden beds. It’s an exceptionally ugly plant, with its broad, sharp leaves that look like the blade of a rusty hacksaw. I first noticed it last weekend but didn’t get to it until today, and in the intervening week it spread like a fungus to cover more territory. It’s a tenacious plant, too, hugging the ground and stubbornly resisting all efforts to pull it out by the roots and kill it once and for all. After some careful searching I found the root and gently pulled it whole from the damp soil. I felt a glowing sense of accomplishment as I removed the unsightly blemish from the beds, dropped the weed and its roots into a lawn refuse bag, and then moved on to do battle with the thistles, chickweed, mallow, and other thorny, repulsive broadleaf invaders trying to ruin my garden and yard. I paused for a moment, though, to straighten up my creaking back and ponder the poor weed. It doesn’t know it’s hated and unwanted, I realized — it’s just trying to survive as best it can, wherever it can. Perhaps, I thought, there is value in weeds? Perhaps they provide the sharp contrast that allows us to better appreciate the beauty of flowers and boxwoods and hostas? Perhaps their presence makes us more industrious, by incentivizing us to go out in the fresh air and do some productive work. Perhaps the weed, rather than being reflexively hated, should be pitied . . . and even admired? Nah! It’s weeds we’re talking about, and I would happily do without them. So I moved on and thrust my garden tool into the ground at the base of the next offender, found the root, and pulled it out with relish. Brick sidewalks can be charming . . . but you’ve got to take care of them. If you don’t, before you know it the sidewalk will start to look a little shaggy from the grass growing between the cracks between the bricks. And if you are ridiculously inattentive, and immune to the dirty looks of your neighbors, your can end up with a sidewalk that is a riotous collection of disgusting weeds — like this sidewalk on Columbus Street. German Village is very sensitive to any changes to the outside appearance of houses; when we decided to replace our backyard fence with the exact same kind of fence, we nevertheless had to get approval from some governmental entity. 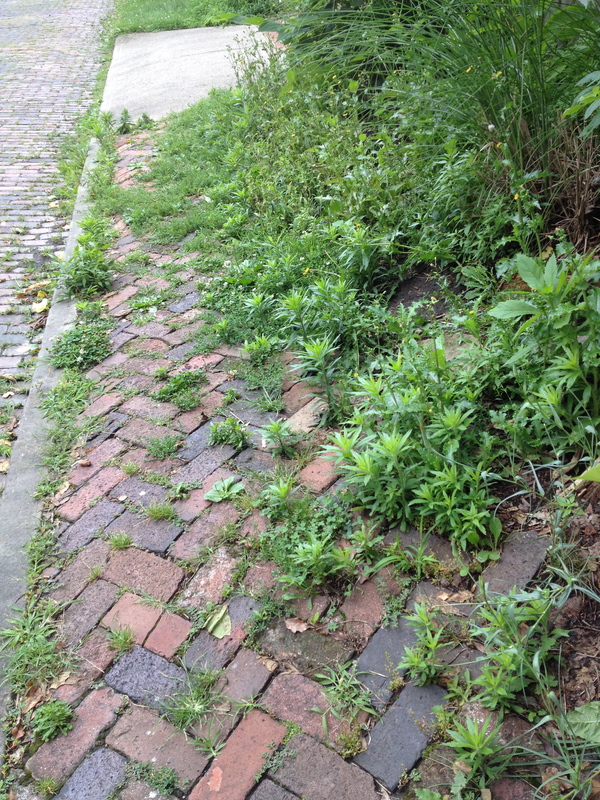 Apparently sidewalk weeds don’t raise the same concerns, even though they look like crap and ultimately will destroy the bricks. 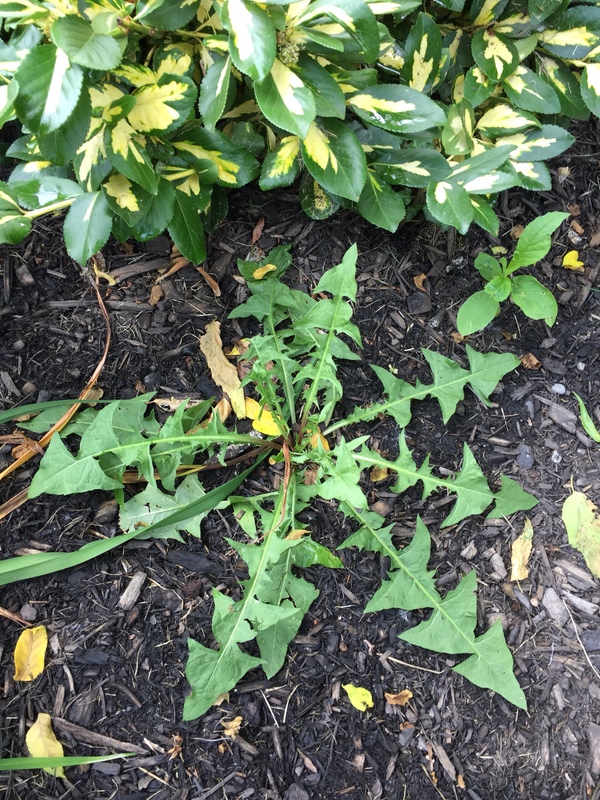 Why aren’t sidewalk weeds more of a focus? The area where I park for work has developed a healthy outcropping of weeds. 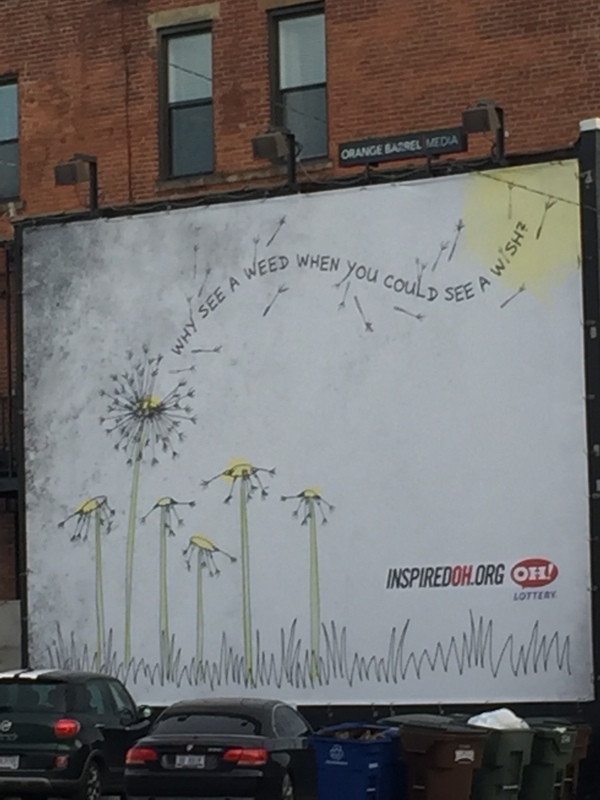 No surprise there: in Ohio in the summer, the weeds just grow like . . . well, weeds. Most of the plants are of the broad-leafed, saw-toothed variety that sprout from every crack and crevice, sprawl everywhere, and look like they’d give you a rash if you touched them. 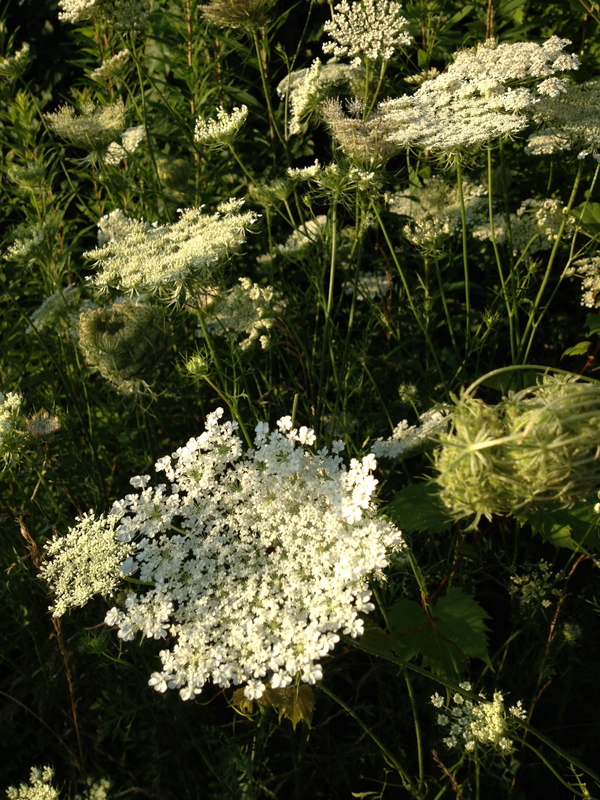 Amongst the ugliness, however, are some plants that grow like weeds but still possess a certain delicate beauty — Daucus carota, more commonly known as Queen Anne’s Lace. They grow taller than the trashy plants and help to mask their unsightliness, making the summer weed season a little bit more bearable. During the cold, dank, seemingly endless winter, forces of evil apparently attacked my yard. Under cover of darkness and blanket of snow, terrible lawn creatures invaded and ruthlessly displaced our attractive carpet of velvety grass. 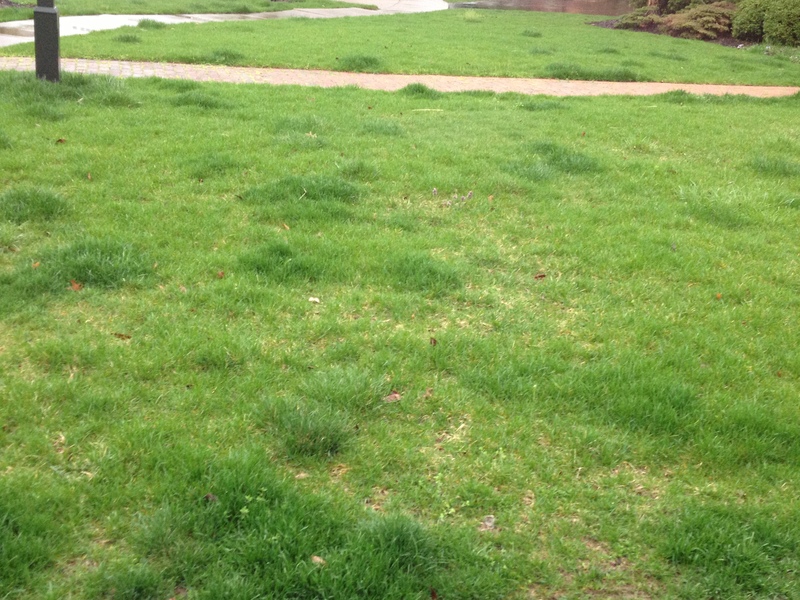 Spring has brought the unwelcome realization that our front yard appears to have a serious case of lawn mange. Where tender shoots of pleasant green once grew we now find bare spots, crab grass, spreading sawtoothed dandelion leaves, and other unsightly, weedy characters. The yard has a distinctly clumpy, uneven look to it. And in the center of one of our lawn sections there is an angry-looking, purple-topped plant that appears to be the youthful version of the man-devouring miscreant from Little Shop of Horrors. Having an ugly spring lawn is embarrassing, but it can have its advantages. Dogs find our yard so appalling that they refuse to even answer the call of nature there. Rabbits treat our property like a death zone. And the lawn undoubtedly will increase our interaction with our neighbors, because if things don’t take a turn for the better we can expect a friendly visit from the Civic Association. It’s time to call the lawn service and encourage them to move immediately to the nuclear option. Yesterday, I just couldn’t take it anymore. Ouchy back and all, I got down on my hands and knees to weed the front yard. I don’t know if it was caused by our warmer than normal winter, or if our grass is just getting wearing out, or if our lawn care service changed the spraying schedule and deferred the weed killer application, but this spring we have been beset by a grotesque plague of weeds. Dandelions, clover, and other ugly looking plants had sprung up everywhere, ruining the uniform, velvety green carpet all homeowners aspire to and making our yard look like a patchwork quilt of unsightliness. It was offensive to look at, and I didn’t want the neighbors to think that we were letting our yard go to seed. 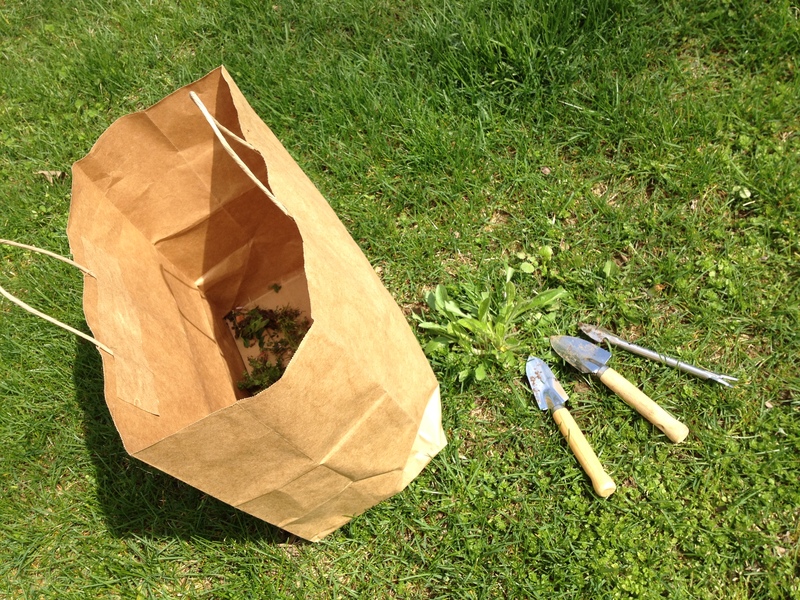 So I went out on weed patrol, with my paper bag and my weed control tools. I know spraying is effective, but I think it’s best to get down close to the spot, get some dirt under your fingernails, and dig the weeds out roots and all. I use some spoon-sized shovels to get under the weeds and work them out of the ground; dandelions, for example, come out with a satisfying pop. And, because I’m using small shovel, the yard doesn’t end up looking like I’ve got a gopher problem. I worked on the front and side yards for a few hours yesterday and left them looking moderately presentable. Neighborhood pride is a powerful motivator. I used to weed our beds with joyful, reckless abandon, pulling out the offending plants by the handful. Then, about 10 years ago, during one of the high summer months, I got a bad poison ivy rash for the first time, and my gardening life changed forever. My hands touched the poison ivy as I was kneeling and weeding the beds on the side of the house, seating heavily as I worked in the summer sun. This turned out to be most unfortunate for me. When I mopped my sodden brow the diabolical irritants on my hands were able to get into the open pores on my face and were splashed onto my arms and chest and legs. By that evening, it was clear that I was in trouble, and by the next morning my rash — technically a case of contact dermititis — was comically bad. My face was bright red and so swollen that my eyes were slits. I also was dealing with multiple patches of misshapen red bumps on every limb that cried out for a vigorous itching. When I went to a dermatologist and took off the sunglasses I was wearing to cover my alien-looking face, the he burst into laughter and said it was the worst case of poison ivy he’d ever seen. The boys found my appearance equally amusing.